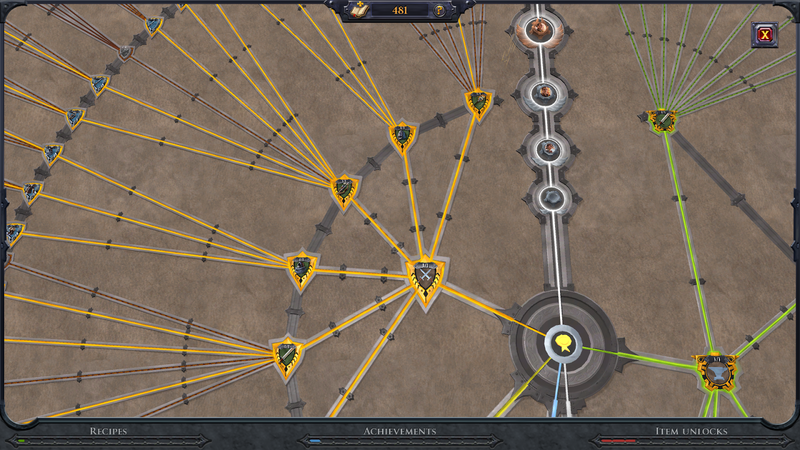 The most crucial game element that you need to understand as a new player to Albion Online is the Destiny Board. This board shows your character's progress and growth as a warrior, a gatherer, a farmer or any other role you would like to play. The Destiny Board is like a giant tree of missions that unlock a character's ability to use certain tools or weapons. It basically lets you know exactly what your character is capable of and what they need to do to unlock other skills for the future. The Destiny Board can be viewed from its default hotkey N or by clicking the button in the top right of your screen that looks like 4 nodes connected by lines. When you first look at the Destiny Board, you will see that it is divided straight down the middle by a white line. This line contains the missions tied to your Adventurer Level. The missions below the center on the white line are the introductory missions that you did in the first five minutes of that characters life (gather a T1 stone, kill a bunny, wear the bunny, etc.). The missions above that reflect your Adventurer Level up to level 8. Adventurer Level is tied to what tier mounts you can use, what capes and bags are usable and what tier of building you can upgrade or destroy. On the left of the Adventurer line are the trees for what gear you can wear and what you are capable of in farming, cooking and alchemy. The weapons and armors are broken up into 3 sets each. The Warrior set contains plate armors and weapons like axes, swords, hammers, crossbow, mace and shields. The Hunter set contains leather armors and weapons such as the bow, spear, nature healing staff, daggers, quarterstaff and torch. The Mage tree consists of cloth armors and a variety of magical staffs like fire, frost, arcane, curse, holy healing staff, and the tome off hand weapon. The farming tree details which seeds or baby farm animals you can plant in your personal island farms and also shows which foods you can cook and which potions you can concoct. 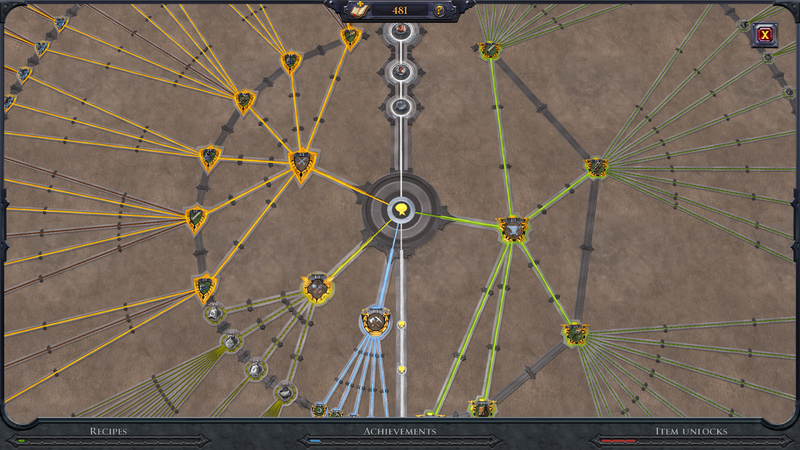 The tool tree shows which tier of tool you can use of each type and your mastery level within each tool tier. Tool mastery level affects your resource gather bonus. One the right side of the Adventurer line are all of the crafting trees. These show what tier of gear you can craft, which accessories you can craft and which resources you are able to refine. The weapon/armor crafting trees have the same set up as the weapon armor trees on the left but affect what you can create, not what you can use. Once you get past the introductory missions in a specific mission line, you will notice that the mission experience bar when viewed from the Destiny Board is broken up into two differently colored sections. The first 20% of the bar is red and the second 80% is colored yellow. This reflects the difference in Learning Point cost. Learning Points are a type of currency that is unique to your character. As a character with Premium status you start with 100 LP on your first day of Premium (minimum of a 30 day Premium time to unlock this one time bonus). After that you passively generate 20 LP a day for the duration of your time with Premium status. Learning Points can be spent to complete a Destiny Board mission without putting in the work to grind through the xp. Since the only way to get LP is to let it passively generate over time with Premium status, it is wise to not spend your LP frivolously. While the developers wanted to give players a way to completely skip the grind to unlock a new weapon or skill, they wanted the decision to be a weighty one. So although you can completely skip most missions just by spending the LP, the first 20% of the experience bar costs 8 times as much per skipped xp as the last 80% of the experience bar. This makes it way more cost effective to actually put in the work to level up the first 20% of the xp bar before spending your LP. 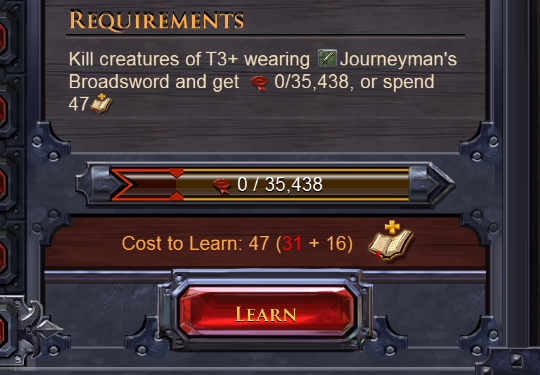 For example, to unlock the use of T4 swords you need to gain 35,438 kill experience while wearing a T3 sword. You could spend the 47 Learn Points to skip this task, or you could put in 30 min of PvE killing with your t3 sword to get through the first 20% of the bar. The LP cost is then only 16 LP for the remaining 80% - a savings of 31 LP (a day and a half of LP) for 30 minutes of work. One of the most important things to understand in the game is that it is VERY unrealistic to want to do everything with one character. You are certainly allowed to try if you want to but it will involve a lot of grinding to unlock everything. In fact, I personally do not think that it would even be rewarding to have everything unlocked. Due to recent changes it is not actually that hard to unlock every weapon and armor at Tier 4, which would allow you to test every weapon's play style and decide which two or three weapons you really enjoy and want to level to a high tier. So when you start a new character consider what role or play style you would like that character to fill. Are you a daring player killer who scorns the idea of ever cutting down a tree or picking a flower? Are you the enterprising merchant with an eye for which goods are selling at high price in different cities? Are you the adventurous gatherer who likes to explore dangerous zones for the best resources? Your play style will inform which of your characters attributes you will want to hurry along through the use of Learning Points, and which ones you can leave to level up slowly through grinding. Completionism is NOT the goal. 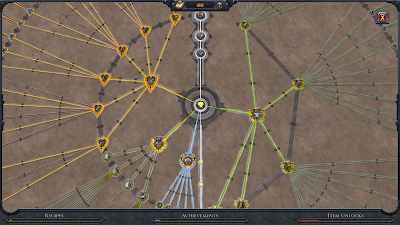 The next thing you will notice in the structure of the Destiny Board is that it is laid out in concentric circles. Looking specifically at the weapons and armor, this is how the board is laid out, starting from center. Trainee Fighter - unlocks the ability to use T2 weapons and armor. Journeyman Fighter - unlocks the ability to use a certain type of T3 armor or weapon (you must be wearing that type of chest armor or weapon type in T2 in order to advance the experience bar). The next ring contains the Fighter missions. The Fighter missions control what tier of that weapon or armor type you can use. 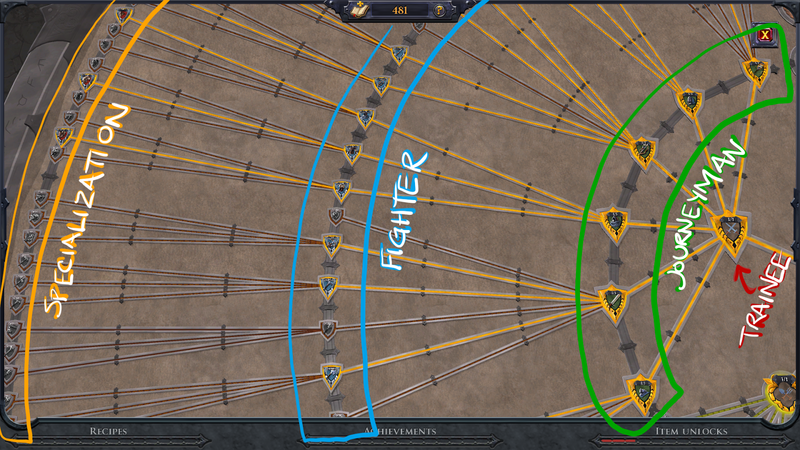 For example, the Bow Fighter missions will allow you to rank up from a Tier 4 warbow all the way up to a Tier 8 warbow. 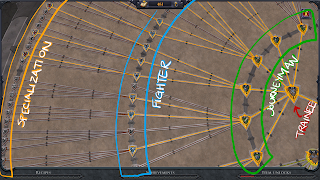 The Bow Fighter missions rank up all types of Bows at once (bow, warbow, and longbow) and can be used interchangeably. In order to advance a Fighter mission you need only to be wearing a minimum of T4 of that type. The next ring in the Destiny Board contains the Specialist missions. These missions are only advanced while wearing a specific armor or weapon. They do not help you level up or use the next tier of that weapon. They just give you extra mastery points for the weapon or armor you use the most. These mastery points make you stronger while wielding that specific weapon - a person with high specialization will deal more damage with an identical weapon than a person with no specialization with that weapon. This helps reward players who are loyal to specific weapons and actually work hard to perfect their play with that specific weapon rather than jumping around and being a jack of all trades. I have yet to determine how big of a difference Specialist levels make, and in my opinion you should never use LP to level this. Be careful when selecting a mission to spend LP on. It is VERY easy to spend points on the specialization mission while thinking that you are spending it on tiering up. When you first started a character you probably noticed the missions telling you what to do. They start out simply but by the time you finish the tutorial you will have a lot of available mission and it is not very helpful to have them all fighting over your display. Underneath the mission display there is a little arrow button pointing up. Click on this to customize which mission types are displayed. There are 5 types of missions - mostly self-explanatory: Crafting, Gathering, Fighting, Farming and Fame Ranking. Fame Ranking is the mission that shows your progress with your Adventurer level. Farming Missions include cooking and alchemy. Turning different mission types on and off will help you only have to look at crafting missions while crafting, or gathering while out gathering. Or you can uncheck all of them to give yourself more screen space. I personally keep them all turned off when I PvP because if you accidentally click on a mission while fighting it will open up your full screen Destiny Board, which can get you killed. There is also an option to choose in what size the missions are displayed. Wide gives the most information with complete mission requirements and experience bar numbers, and how many LP to upgrade. Small gives an abbreviated version of Wide. Mini (my favorite) shows only the icon with the experience bar filling around the edge. If you hover over the Mini mission, it will tell you the title of the mission, LP to skip, and xp earned/xp total needed.